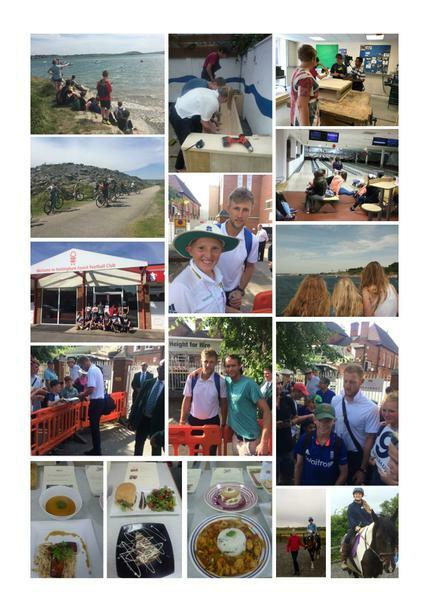 On Tuesday 18th and Wednesday 19th July HCC embarked on the ambitious task of taking over 90% of pupils out of school, with the remainder being involved in various in-school fun activities. Here are a small selection of accounts. 12 students in Years 7 to 10 have been making contemporary wooden furniture following Mr Rowe’s own design. Students have worked in small teams with Mr Rowe, Mr Caudle and Miss Urquhart constructing separate sections of the seating design. Half of the materials were kindly donated from the PTFA and this matched the College’s funding. This activities day enabled students to use their technology skills in marking out, drilling, and fitting the various components together, to produce some contemporary furniture for student use. On the first of the activities days, one trip out was to Wadebridge, where we hired bikes and helmets and enjoyed a beautiful sun baked cycle along the Camel Trail to Padstow. It was a real team event and we all made it to Padstow to lock our bikes up in good time. We took a moment out to sit and enjoy the stunning sea view and sea breeze when we arrived. Then we took a short walk into Padstow harbour, which was bustling with summer activity. From a Cornish Male Choir to luxury yachts and ice cream, pasty and fudge shops galore. Students had some time to enjoy the town and then we all enjoyed well-earned fish and chips sat on the harbour slipway. We were lucky with the weather until...the return cycle ride, where we progressively cycled into strong winds and the biggest raindrops we have seen. Saturated, we arrived back in Wadebridge still smiling and having had a super day. Well done everyone involved, we had a great day. On Monday 17th of July we went on a trip to Nottingham (Trent Bridge) to watch the cricket match England vs South Africa. We started travelling at ten to five in the morning, it took us five hours to get to Nottingham (plus some stops along the way). Once we had got there we parked up and went over to watch the cricket. England were batting and the South Africans were amazing fielders and unfortunately got all of our team out. After the cricket we went to Nottingham Forest football club and then on to Notts County football club, the oldest football club in the world, where we went onto the pitch. The absolute highlight was then meeting the England cricket team with lots of us getting pictures and selfies with James Anderson, Stuart Broad and the England captain Joe Root. After that we checked into our hostel and then had tea at Wetherspoons. We then went on to play crazy golf. It was a very hectic day, but one I will remember for a long time. As there was no cricket we had a tour around Nottingham, went shopping and went to the fair. We also travelled home. On day 3, we went to Bude to play cricket. In the first innings we got 98 and Bude got 80. In the second innings we got 90 and they got 63, so overall we won which completed a great 3 days! A great day, in spite of the long journey to Helston. Students and staff had a fun-filled day at Flambards. Students ran around madly excited, got soaked on the log flume and now have the claim to fame that they have ridden the most southerly rollercoaster in Britain, ‘The Hornet’, a fact that our own Mr Hosie is extremely proud to share with all! There were other rides that spun, threw, chucked and whirled everyone around, which were very popular. We also found some time to sample some history in the Victorian Village and the Blitz exhibition. Our students were a credit to the school, and their families, and we enjoyed seeing their excitement throughout the day! Mrs Rollason, Miss Johns, Mrs Cobbledick, Mrs Blacher, Mr Shears, Mrs Walsh and Miss O'Brien took 44 pupils to Plymouth for a 'harbour cruise' off the Barbican with 'Plymouth Boat Trips'. The weather was beautiful and the cruise was really interesting; the Captain commentated on the geography and history of the area, and landmarks, over a loudspeaker as we sailed along. The students were absolutely brilliant and the staff on the boat commented that our students were very well behaved; they made us proud, as usual. We then went up to the Barbican Leisure Park and had lunch in one of the restaurants. We split up and everyone chose their favourite out of: Nando's, Pizza Hut, Frankie and Benny's, Chiquito or Pizza Express. We got back on the bus just as the rain, thunder and lightning hit Plymouth, and were back in time for the buses! Just! Mrs Rollason, Miss Johns, Mrs Blacher, Mr Hosie, Miss O'Brien, Mrs Cobbledick and Miss Bate, took 45 pupils bowling in Bude at Harlequinn’s Leisure. The pupils all played competitive games and then had an early lunch before we drove to the Rebel Cinema to see Despicable Me 3 - which was brilliant. The cinema gave all the pupils free popcorn and a drink. Mr Hosie regretted getting salty popcorn and resolved to have sweet next time. Luckily, he had a Mr Juicey carton to quench his thirst! The students seemed to enjoy the private showing of the film. It was excellent having the cinema to ourselves. The pupils were an absolute delight to spend the day with. Some ambitious menus were created on Wednesday the 19th July by students opting to take the HCC Masterchef Challenge. Cakes were made, vegetables chopped, cream whisked, chocolate melted, soup blitzed, salads dressed and all dishes finally assembled for judging. It was an incredibly close call with the judges finally deciding that the sweet potato soup starter followed by the grilled miso salmon with rice noodles by Drew Williams was the winner. Olliy Inkpen and Eloise Warren jointly won second prize with their cheese stuffed burgers and chocolate cheesecake, which was amazing. Lydia Girdler was third with an enterprising dish of coca-cola chicken, which was fantastic, followed by a strawberry shortcake. Well done to all the entrants, who delivered some fantastic dishes, all of which the judges could have happily polished off! Thank you to all the staff and pupils who made the trips and activities so much fun and memorable!